Motion Solutions is committed to supporting our community and participating in the educational efforts that develop the engineers and business professionals of tomorrow. We strive to incorporate our mission of making the world a better place into everything we do. Our talented team engages with the local and greater community to bring that goal to reality. Team members at the Families Forward Back to School event. Top row (L to R): Debbie Newman, Albert Miguel, Yedid Enriquez, Griffin King, Nika Daroui, Jorge Alarcon, Junior Aldaco, Albert Garcia. Middle row (L to R): Miguel Moreno, Daniel Bickerstaff. At bottom: Ken Smith. Our goal of making a positive difference in the world the world means more than just empowering our customers to make life-changing and life-saving products. It also means giving back. As company, we established an initiative to increase our charitable efforts in the community. As a team, we made a commitment to act locally and be personally involved. The combination of the two led to our connection with Families Forward of Orange County, California. Founded in 1984, Families Forward focuses on assisting the working homeless. Its offerings include affordable housing, a food pantry, and counseling services for homeless and at-risk families. Our team has dedicated time and effort to Families Forward. We have conducted drives of school supplies in support of the organization’s back-to-school programs. We sponsored a Charity Walking Challenge to raise donations for food items to supply their Thanksgiving Food Baskets. 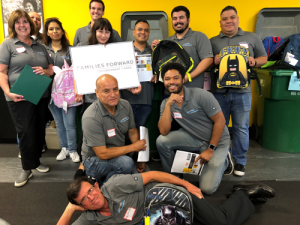 Motion Solutions volunteers have given their time at community distribution events for Families Forward. These activities represent just the start of what we expect will be a long-term relationship with the organization. Team members at the Thanksgiving Food Basket Event. Left to Right: Albert Garcia, Nika Daroui, Bill Saunders, Debbie Newman, Tracy Summers, Scott Depenbrok, Gabby Wang, Damian Flores, Sam Celani, Sherry Malin, Ken Smith. 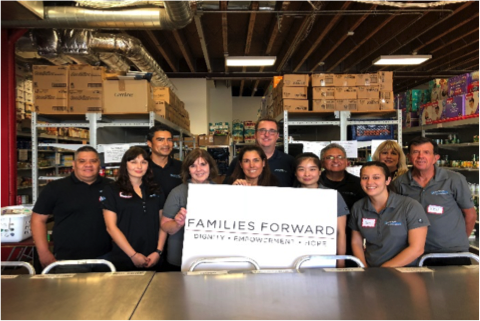 The Families Forward programs are particularly meaningful to our volunteers in that they let us balance charitable giving with personal connections. Our people donate their time to the program. These activities bring all of us closer to the community we live in and help strengthen the bonds among team members at Motion Solutions. We actively support higher-education institutions and students through a variety of outreach and partnership efforts. Our program includes internships and career recruiting, sponsorships, mentorships, and donations of equipment. We have an ongoing relationship with the California Mechatronics Center (CMC) at California State University, Chico. CSU Chico is one of only a handful of US universities to offer a degree program in mechatronics, an engineering sub-discipline built around a practical, integrated design approach. This program has made CSU Chico a hub of engineering talent – an estimated 90% of students who graduate from the program go on to design automated systems. Of course, training is only as current as the equipment students train on. To help equip the CMC, we have made substantial donations of motion equipment on an ongoing basis. Most recently, we gave them several pallets of motion components, including 28 state-of-the-art THK KR33 stages. 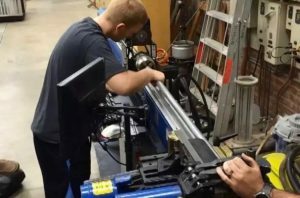 The equipment enables upper division students to get hands-on experience building motion systems with the same equipment they are likely to use after graduation. Elsewhere, we have donated electromechanical equipment to the FabLab at Laney College. Born out of MIT’s Center for Bits and Atoms, the FabLab is essentially a high-tech workshop designed to encourage innovation and entrepreneurship. FabLabs help support the growing maker movement. To help support this program, Motion Solutions sent a wide variety of equipment to the FabLab, including motors, drives, actuators, and various other components. Our efforts don’t end there. We also give students hands-on experience through internships. We get the benefit of a fresh perspective. Our interns walk away with real-world experience in solving problems and applying the skills they are acquiring in their courses. The experience positions them for moving into a professional job after they graduate – even, when appropriate, with us. Motion Solutions believes in excellence and giving back. That philosophy guides our actions, from our exceptional engineering to our engagement with our community. Participating in the types of initiatives described above doesn’t just provide direct benefit, it enriches all of us as people. As a company and as a team, we are committed to our mission of making the world a better place.